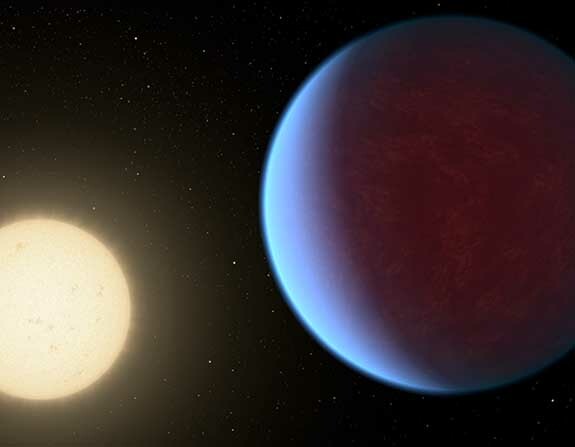 Super-Earth 55 Cancri e, which made headlines in 2012 as “the diamond planet,” needs to be reclassified as a sapphire planet, according to astronomers at the Universities of Zurich and Cambridge. “We are turning the supposed diamond planet into a sapphire planet,” said astrophysicist Caroline Dorn, the lead author of new research published in the British journal Monthly Notices of the Royal Astronomical Society (MNRAS). Previously, scientists speculated that one-third of the 55 Cancri e super-Earth, which is 40 light-years away in the constellation of Cancer, might be composed of pure diamond. The presence of carbon, combined with the planet’s high density and extreme heat created the perfect conditions for creating diamonds. Taking a stab at the potential value of a diamond planet, a Forbes columnist did the math and came up with a value of $26.9 nonillion. That’s $26.9 followed by 30 zeros. But, Dorn and her team say that new observations of 55 Cancri e, as well as two other super-Earths, have forced them to discard the theory of a “diamond in the sky.” They determined that these new, exotic planets share a number of characteristics. They all formed at high temperatures close to their host star and contain high quantities of aluminum oxide — the compound that makes up sapphire and ruby. “Perhaps it shimmers red to blue like rubies and sapphires, because these gemstones are aluminium oxides which are common on the exoplanet,” said Dorn.